So before I begin I'd like to make it very clear that I'm by no means coming back to the forums with what was my weekly schedule back then of posting 2-3 times a week, I'm merely summoned back here through a recent ruling that I happen to believe is in my opinion severely incorrect. Despite people telling me since I stopped making my posts on here that they in fact enjoyed them very much and Garett even telling me this past UK Nationals that apparently I have my own fan base in Canada, I don't think it's something I want to go back to on the grounds that, in a nut shell, my posts consisted of rambling on various topics, cringey posts like the one where I claimed I could beat the world record for "the longest TCG session" and that one flame thread that tarnished my reputation for quite some time. But anyway, I'd better get on with it. here is a link to the card for reference --> http://ufsultra.com/showcard.php?id=6027 simple enough. Throw grants the ability "If this attack is completely blocked, it still deals half damage (rounded up) during the Damage Step." 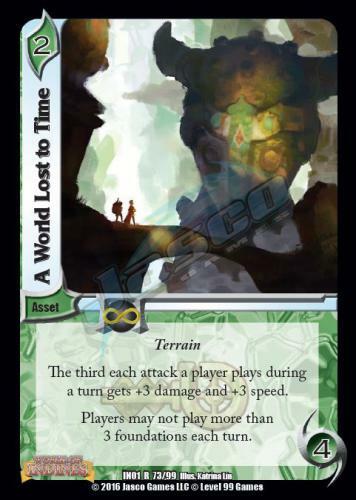 Recently, in the Jasco Games FAQ section, they spoke about how if you are the active player and you play a Throw then your opponent uses the enhance on "What Lies Ahead". During the damage step, the Throw will deal 1 damage. Not only do I believe this ruling is incorrect, but I can also explain why, so wish to make an appeal for this case. There's a really important part of the text on "What Lies Ahead" that leads me to believe this should not make a Throw deal just 1 damage during the damage step. E Commit: If this attack is completely blocked, it still deals 1 damage during the Damage Step. So lets say I play a Spider Suplex, which is base 6 damage and has the Throw keyword as we all know. My opponent uses the enhance on "What Lies Ahead"
We both then pass enhance and go to a block step. "What Lies Ahead" is now ensuring the attack still deals 1 damage. But my Throw is dealing a total of 3 damage to them. Therefore, the attack has still dealt 1 damage of a total of 3. Now you can see now why I'm wanting to make an appeal for this case. If "What Lies Ahead" lost the word "still" in it's effect and instead read "If this attack is completely blocked, it deals 1 damage during the damage step" then fair enough... no harm, no foul as it would then change the value the completely blocked attack is dealing to 1 rather than ensuring it still deals at least 1. I now believe the right course of action would be to either reverse this ruling or errata cards like "What Lies Ahead" "Direct Hit" and "Huitzil" not only in the case that this happens to be an incorrect ruling, but for the sake of fixing them cards so it's wording isn't so misleading and blurry in the case of this scenario as Throw decks simply are going to come across this if a "What Lies Ahead" is on board. Now, I'm not seeking an answer from someone on here as it's most likely unofficial, so I will be putting this forward to the correct staff of Jasco Games to handle, but the reason I'm posting this here is because I want to know what the community's thoughts on this actually are. Seems like a really viable solution. Ill be honest when I first saw the ruling I did a double take and then promptly went doing the magical journey of learning how fired effects procked off of the same trigger interract with each other if they have conflicting effects. In honesty it kinda creates a weird bit because the reason it works is because "the last effect proced by the same trigger is what gets to happen" which then causes some confusion on "well what happens if Plant man uses Tengu Dive?" That ones easy enough to say that the fired effects both happen in the order you choose since they dont have conflicting outcomes, but then the ruling on WLA can be consolidated to the simple rule where "if 2 effects are trying to conflict, the more restrictive one wins" where then what happens is the throw keyword tries to deal half damage while WLA tries to have it deal only 1 damage, the later winning out for being more restrictive. Hopefully it doesnt cause too kuch controversy on "how it should be done". At this point I feel like it's pointless to nitpick the wording of a card, and just go with the ruling on how they want it to work. This is nothing new from the last year and a half. Whether it's a simple mis-spelling, or not knowing what's in the LGR or how cards work, it's all the same in the end and we get weird things happening. If they don't want WLA to work on throws, they'll handwave and it won't work, and that's the end of it. Hopefully they'll make such an announcement a little bit before 5 MINUTES BEFORE A CARDBOARD EVENT, fingers crossed. 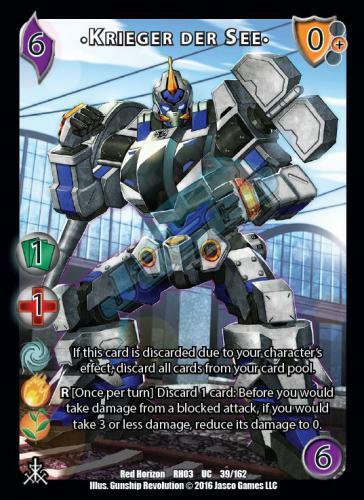 But I believe the 'best' reasoning for WLA working on throws, is that it uses the same text as the throw keyword, just replacing the number on the damage. It doesn't make lots of sense, but it was (hopefully) what was in mind when they made the card, as it has been ruled this way for a while now. The wording functions, it's not even a handwave. As for blue bot, that's a handwave. Lost to time, banned who gives a poop. 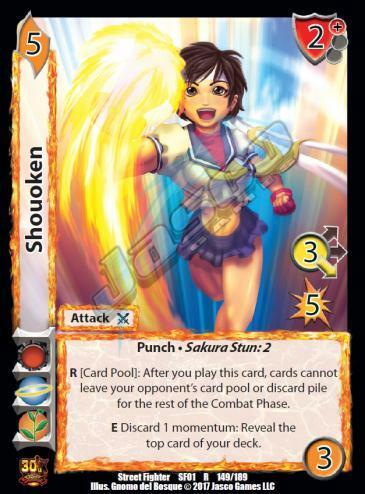 Shououken has been issued and errata. 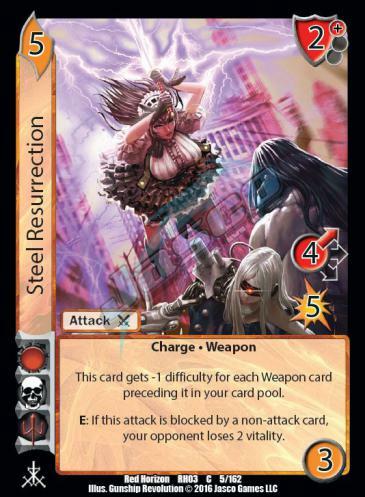 Steel res was worded improperly and instead of invalidating the card, they said it works. Anyways, WLH creates a situation where you run a real poorly statted card to get a anti throw tech piece. You still gain momentum to do stuff with, not just grind the game out by playing only throws and nothing else. If this attack is completely blocked, it still deals 1 damage during the Damage Step. The word "still" here is a bit of a weasel. You read it and decided that it sets a baseline. I read it and see it kicking the door open on an attack that normally wouldn't deal any damage. It's a short sentence, and I don't see any way to favor one reading over another, based only on those 14 words. But if you look at the explanation you need to make around the ruling -- if you need to write a document explaining how to understand complicated interactions between several such effects that might have subtle differences -- then I think that one way to read the sentence makes your job easier, and one makes it harder. The FAQ ruling embodies a fairly simple principle: When you have two or more rule effects changing the same rule, the last one completely replaces all the others. That principle, plus the "can't overrides can" principle and the ability to correct recognize Rule Effects, are all you need to make the same ruling or similar rulings in similar situations. I now believe the right course of action would be to either reverse this ruling or errata cards like "What Lies Ahead" "Direct Hit" and "Huitzil"
If this attack is completely blocked, it deals 1 damage during the Damage Step. I also thought about adding the word "instead" in here, but I don't think it adds any clarity. The phrase "during <some step>" is a big hint that you're replacing what would normally happen during that Step with the contents of this effect -- like Felicia adding your card to the momentum "during the End Phase"
WLA is arguably the best 1-drop in the game behind Bridging? This is all very mad. Kevin understands how I see this card due to it's poor wording. I see it as a baseline for reasons I've already explained about the attack stating "still deals" rather than "it deals x amount"
or in other words "If I give you 3 coins, have I at least given you 1 coin?" - of course I have. Although poorly worded, the card still functions within the rules, no errata needed. It chumps throws, you still gain momentum. Do something with that momentum to murder the opponent.